Estate agent morning meetings are a staple of most offices, but could your meeting be costing you money? On a chilly morning a couple of weeks ago, I drove up to Penrith to attend a Rightmove seminar, along with around 50 local agents. These seminars are always really interesting, and I generally come away with my head buzzing with new ideas. This one was no exception. However, one big takeaway was when Miles Shipside shared a couple of graphs showing the pattern of phone and email enquiries into agents’ offices. Phone calls tend to be at their highest levels between about 8.45am and 10am, whereas emails peak after 8pm in the evening. No surprise there really, if you think about your own phone and email patterns. This does beg a rather perplexing question though: if the first hour or so of opening is a flurry of activity, answering phone calls and returning emails, why do most agents hold their morning meetings at exactly this time? There’s no doubt that staff meetings promote good communication, raise awareness of new clients and properties, increase and maintain levels of motivation, and generally encourage everyone to behave like a team. But do they need to be held first thing in the morning? Of course, not all agents switch the calls to answerphone during their meetings; some will assign someone to man (or woman) the phones, but is this the best way of making sure all calls are answered quickly, efficiently and without distraction? 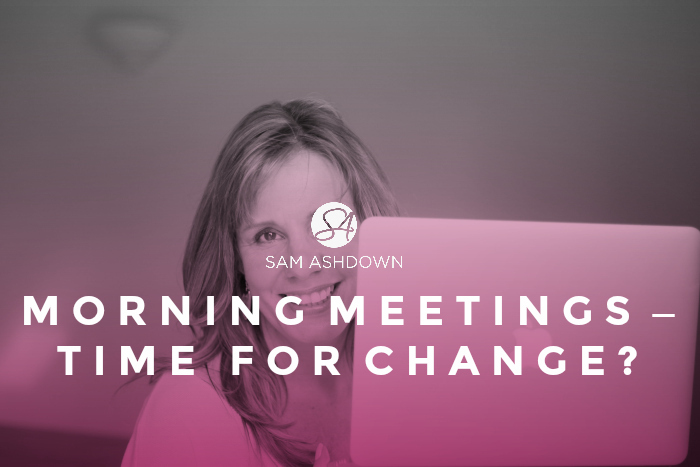 After the Rightmove seminar, I had the chance to talk to some agents about their feelings on the subject, and there was definitely a general reluctance to move the meetings to a different time of day. I can understand this, given that it’s often the only time slot where you can pretty much guarantee everyone will be in the office, and the earlier the meeting, the less likely distractions can crop up to prevent attendance. But let’s look at the bigger picture here: it’s clear that the first 90 minutes each morning are the most valuable in terms of inbound enquiries. These could be vendor, purchaser, landlord or tenant enquiries, and therefore the quality will certainly vary. But can you take the risk of missing a call from a new client, perhaps ready to add a chunk of profit to your bottom line? There is not an easy answer to this challenge, and I’d love to hear your thoughts on the subject. What do you do? When do you hold your meetings? How do you manage the dual priorities of staff management and morale, and client enquiries? Let me know in the comments below, or send me an email at sam@home-truths.co.uk and I’ll share the best ideas in a future post. Speak to Sam: If you’d like to have a chat about how you can do it differently, drop me a line at sam@home-truths.co.uk – I’d love to hear from you. Hi Sam – how are you? We hold ours between 8.30 and 8.45 am – solves that problem – we always find if it runs past 9 then everyone is distracted by calls… and no one wants to let a phone ring!